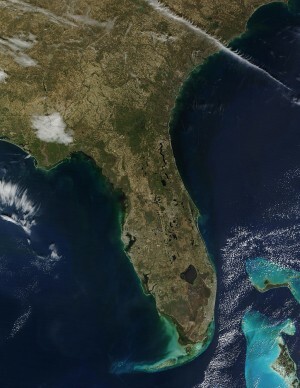 A state of water--Florida from space. Florida is still reeling from a disastrous 2018 in which south Florida waterways suffered a double whammy of blue green algae and red tide. Meanwhile, here in the panhandle the powerful Hurricane Michael caused historic damage and highlighted continued weaknesses in our sewage infrastructure. Now, the Florida legislature has just convened, and we're pushing for them to help right the many wrongs of failed policies on water and growth that defined the Sunshine State last year.If there was a silver lining at all in last year's epic crisis of blue green algae and red tide, it's that it happened in an election year. As such, candidates for office made plenty of promises to fix the problems of water pollution especially the nutrient pollution and water management issues that caused the crisis.Some of those officials are following through. In the early days of the 2019 session, there has been a flurry of bills addressing septic and sewage pollution, land preservation, water quality, and more. Bill related to better controls on sewage especially from septic systems (which service 30% of Floridians), limits on the spreading of biosolids (dry leftovers from sewage treatment plants) on agricultural lands, and regulations on urban fertilizers are ones we are closely watching. In terms of land preservation, the Legislature continues to take a piecemeal approach rather than the comprehensive and highly-effective strategy that was land preservation in Florida until around 2010. For many years the state had one of the best preservation programs in the country, spending $300 million annually on the purchase of undeveloped lands ranked in priority for their ecological value.Unfortunately, bills introduced thus far spend far less and in disparate geographic areas rather than statewide. Some land preservation monies are directed toward items such as wastewater treatment facilities not how land conservation monies are supposed to be used. We continue to push the Legislature to honor the will of Florida voters, who in 2014 voted to put land preservation in the State constitution and to guarantee funding which the legislature has not honored. Undeveloped lands filter rainwater and recharge aquifers, and we need more preserved land to protect water quality downstream. As for other items, a ban on fracking in Florida appears closer to action than ever, though the bill still allows for one particular method of fracking and so would not be a total ban. A proposed program that would allow homeowners another option for financing septic to sewer conversion would help ease the financial burden for residents while accelerating clean water projects. In the category of "throwback to the 1950s" is a bill that would fund construction of many miles of large highways into multiple rural areas of the State. These would destroy wetlands and pine forests along the way while opening� now-isolated lands to development all of which would have a negative effect on water quality in rivers, lakes, and coastal areas. Such an approach doesn't fit at all with real transportation priorities in the state, where growing urban populations needs safer roadways as pedestrians and bicyclists are being killed and maimed by speeding cars at the highest rate in the nation. We're spending the legislative session engaging with Florida residents and elected officials to get the best bills passed, and to defeat the worst of the worst. The health of our waterways and the bad memories of the 2018 algae crisis drive us to organize for a better future for Floridians and the waters we love.